Tennessee’s electric co-ops work very hard to build strong and resilient power distribution systems, but winter storms can cause widespread damage for even the most prepared utilities. These tips from ready.gov can help your family be safe and better prepared for winter storms. Disrupt communications, water, and transportation. Close retail businesses, grocery stores, gas stations, ATMs, banks, and other services. Cause food spoilage and water contamination. Prevent use of medical devices. If safe, go to an alternate location for heat or cooling. NASHVILLE – It is an exciting and exhausting time, the culmination of a season of hard work. However, the rush to harvest can also yield tragic outcomes. Each year, dozens of farm workers are killed and hundreds are injured in accidents involving power lines and electrical equipment. “Things get very busy this time of year on the farm, and it is all too easy to forget the danger that may be just overhead,” says Trent Scott, spokesperson for the Tennessee Electric Cooperative Association. Review with all workers the farm activities that take place around power lines. Inspect the height of farm equipment to determine clearance. Keep equipment at least 10 feet away from power lines – above, below and to the side – a 360-degree rule. Use care when raising augers or the bed of grain trucks around power lines. Use a spotter when operating large machinery near power lines. Do not let the spotter touch the machinery while it is being moved anywhere near power lines. As with any outdoor work, be careful not to raise any equipment such as ladders, poles or rods into power lines. Remember, non-metallic materials such as lumber, tree limbs, ropes and hay will conduct electricity depending on dampness, dust and dirt contamination. Never attempt to raise or move a power line to clear a path! Don’t use metal poles to break up bridged grain inside bins. Know where and how to shut off the power in an emergency. Use qualified electricians for work on drying equipment and other farm electrical systems. Operators of farm equipment or vehicles must also know what to do if the vehicle comes in contact with a power line: Stay on the equipment, warn others to stay away and call 911. Do not get off the equipment until the utility crew says it is safe to do so. If this is the case, jump off the equipment with your feet together, without touching the ground and vehicle at the same time. Then, still keeping your feet together, hop to safety as you leave the area. Once you get away from the equipment, never attempt to get back on or even touch the equipment. Some electrocutions have occurred after the operator dismounts and, realizing nothing has happened, tries to get back on the equipment. It is very important that all farm workers and seasonal employees are informed of electrical hazards and trained in proper procedures to avoid injury. For other tips on how to be safe around electricity visit www.everydaysafe.org or call the safety experts at your local electric cooperative. Thousands of children are injured and hundreds are killed every year by hazards found on the farm. Some of these children are working on the farm while others wander into trouble on their own or are invited into hazardous areas. Implement injury prevention strategies today to protect agriculture’s greatest resource, our children. Do not allow children to roam freely on the farm. Design a fenced “safe play area.” This area should be near the house and away from work activities. Inspect your farm on a regular basis for hazards that can injure children wandering on your farm. Correct obvious hazards immediately. Children who are physically able to be involved in farm work should be assigned age-appropriate tasks and continually trained to perform them. They should also be constantly supervised. Equip all barns, farm shops, chemical storage areas, livestock pens, etc. with latches that can be locked or secured so that children cannot enter. Always turn equipment off, lower hydraulics and remove the key before leaving equipment unattended. Do not expose children to hazards. Never carry them on tractors and equipment or invite them into the farm shop, livestock barns, grain bins, etc. Are equipment guards in place? Are hazardous work areas locked? Are farm ponds and pits fenced? Information supplied by the National Safety Council’s Agricultural Division, the National Education Center for Agricultural Safety (NECAS) – www.necasag.org or 888-844-6322. Even when you take precautions, a farm can be a dangerous place. Equipment, livestock and other dangers pose risks for families and employees that are not found in other environments. These unique dangers require unique preparation. The National Ag Safety Database and the University of Maine Cooperative Extension provide this list of items needed to create a farm first aid kit. Most, if not all, of these supplies can be found at the local drug store or are available online. Think about keeping one of these in each vehicle and tractor. NASHVILLE – Electric lineworkers face many dangers – high voltage, heights and extreme weather conditions. Despite these challenges, one of the most dangerous aspects of the job has less to do with what they do and more to do with where they do it. Lineworkers frequently work alongside busy roadways, often only feet away from passing cars. Tennessee’s “Move Over” law was passed in 2006 to protect first responders like police officers, firefighters and paramedics. In 2011, Tennessee’s electric cooperatives led a coalition to revise the state’s move over law to include utility workers as well. Unfortunately, seven years after the law was passed, many motorists do not follow it. The requirements of Tennessee’s move over law are simple. On a four lane road, if safety and traffic conditions allow, a driver approaching a utility vehicle with flashing lights should move into the far lane. On a two lane road or when changing lanes is not possible, a driver should reduce their speed. Electric co-op vehicles aren’t the only utility vehicles covered; service vehicles used by municipal electric systems, telephone companies and utility districts are also protected by the law. More information about the law is available at moveovertennessee.org. Don’t climb trees or fly kites, remote control airplanes, drones or balloons near power lines. If you get something stuck on a power line, call your local electric cooperative or 911 and stay away! If a power line falls on your car, stay inside the vehicle. Call yourself or ask someone to call 911, then your local electric cooperative. If you must exit the car, open the door and jump free of the car so that your body clears the vehicle before touching the ground. Once you clear the car, shuffle away using small steps with both feet on the ground until you are at least 50 feet away. When replacing bulbs, always follow recommended wattage recommendations. Keep equipment at least 10 feet from lines – at all times, in all directions. Inspect the height of the farm equipment to determine clearance. Always use a spotter when operating large machinery near lines. Use care when raising augers or the beds of grain trucks around power lines. Always remember to lower extensions to the lowest setting when moving loads. Never attempt to move a power line out of the way or raise it for clearance. If a power line is sagging or low, call the local utility immediately. If your equipment does hit a power line, stay in the cab. Call 911, warn others to stay away and wait for the utility crew to cut the power. If a fire or another situation makes it necessary to leave, jump clear and move away. Electric co-ops routinely provide electric safety demonstrations for schools and other groups. Contact your local co-op for more information or to schedule a demonstration. Spring is finally here! With the snow melted and the ground ready for planting, eager homeowners like you are gearing up to start those outdoor digging projects. 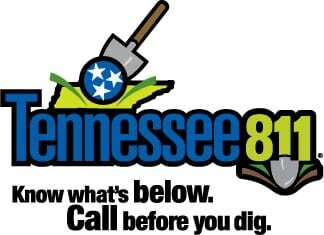 Before you reach for that shovel to start digging, remember to call 811, the Tennessee’s call-before-you-dig number, to ensure that your buried utility lines are marked. April is National Safe Digging Month, and Tennessee’s electric cooperatives want to remind our members that a complex network of pipelines, wires and cables lies just underground. Striking an underground utility line while digging can cause harm to you or those around you, disrupt service to an entire neighborhood and potentially result in fines and repair costs. A call should be placed to 811 before every digging project, from simple landscaping projects like planting trees or shrubs, to building a deck or installing a rural mailbox. Every nine minutes an underground utility line is damaged because someone decided to dig without first calling 811. Don’t become part of the statistic – make sure to call 811! One free, simple phone call to 811 makes it easy for Tennessee 811 to notify all appropriate utility companies of your intent to dig. Call at least a few days prior to digging to ensure enough time for utility lines to be properly marked. When you call 811, a representative from Tennessee 811 will ask for the location and description of your digging project. Tennessee 811 will notify affected utility companies, like your local electric cooperative, who will then each send a professional locator to the proposed dig site to mark the approximate location of your lines. Once lines have been properly marked, roll up those sleeves and carefully dig around the marked areas. Listen to local news or NOAA Weather Radio for emergency updates. Watch for signs of a storm, like darkening skies, lightning flashes or increasing wind. Postpone outdoor activities if thunderstorms are likely to occur. Many people struck by lightning are not in the area where rain is occurring. If a severe thunderstorm warning is issued, take shelter in a substantial building or in a vehicle with the windows closed. Get out of mobile homes that can blow over in high winds. If you can hear thunder, you are close enough to be in danger from lightning. If thunder roars, go indoors! The National Weather Service recommends staying inside for at least 30 minutes after the last thunder clap. Avoid electrical equipment and telephones. Use battery-powered TVs and radios instead. Shutter windows and close outside doors securely. Keep away from windows. Do not take a bath, shower or use plumbing. If you are outside and cannot reach a safe building, avoid high ground; water; tall, isolated trees; and metal objects such as fences or bleachers. Picnic shelters, dugouts and sheds are NOT safe. Every year, the U.S. is hit by many natural disasters, including snow and ice storms, tornadoes, hurricanes and wildfires. These types of disasters pose a significant threat to our communities and homes. The most important step you can take to keep you and your family safe is to prepare beforehand, but knowing what to do during and after the event is crucial as well. Water: You will need one gallon per person per day. If you assume your family of four may be stranded for a week, store a minimum of 28 gallons. Food: Stock up on non-perishable or long shelf-life items, such as wheat, soybeans, canned fruits, peanut butter, jelly and condensed soups. First Aid Kit: Make sure your kit includes adhesive bandages (assorted sizes), antiseptic wipes, aspirin, hydrocortisone ointment, scissors and a thermometer. For a full list of suggested items, visit www.redcross.org. Flashlights and candles: Be sure to keep extra batteries and matches (in a waterproof container) on hand. For additional guidance on emergency items to keep around the house, visit www.ready.gov/build-a-kit. Also consider training offered by local emergency management services such as Community Emergency Response Team (CERT) classes. Some disasters occur suddenly, but many bring advance warnings, like hurricanes and winter storms. Pay special attention during the week leading up to the event for local and state government warnings and evacuation notices. Make sure every family member knows what your emergency plan is: staying or leaving, safe rooms in the house, where supplies are located, what to do if anyone is separated, and how to notify loved ones that you’re safe after the event. It’s also a good idea to know where your home’s main water and gas shutoff valves are located. Electric co-ops spend millions of dollars each year to improve the resiliency and durability of our distribution systems, but it is possible to lose power during a storm. The outage could be momentary or last hours or even days. If you live in an area where loss of power after a storm could be dangerous, consider purchasing a backup generator for your home. These can cost anywhere from a few hundred to few thousand dollars, depending on your needs. Be sure to test the generator before the disaster to ensure it’s operating properly. Consume perishable and refrigerated foods first before they spoil. Pack frozen foods close together and consider freezing water bottles to eliminate any air pockets. The frozen water will help keep the food cooler longer. Make sure you have alternative lighting sources, like candles and flashlights (with spare batteries) located throughout the home. Keep manual tools such as a can opener on hand to replace any electronic gadgets you typically use. Similar to filling a bathtub with water before a storm, make sure that all cell phones are fully charged. If the disaster involves lightning, unplug all electronic devices to protect against a power surge. After the storm, be cautious when leaving your home. Listen to government warnings and use common sense when approaching any damaged buildings or fallen trees. If you see a power line that is down, always assume the wires are live and dangerous. If possible, call your local electric cooperative to report the downed power line. With a little bit of forethought, you’re highly likely to make it through a disaster without too many problems. Remember, you and your family’s safety should always come first. For more information on disaster preparedness, visit www.ready.gov. Your fireworks might be legal, but that doesn’t mean they are safe. The U.S. Fire Administration reports thousands of fireworks-related injuries each summer. The biggest threats: firecrackers, followed by bottle rockets and sparklers, which burn at about 2,000 degrees. Fireworks are especially dangerous when used near power lines, so stay clear. Light fireworks only in open areas where no power lines can be seen, and call your cooperative immediately if your celebration gets tangled in an overhead wire. Children should be spectators, not participants, in the show. Never give children fireworks or sparklers. Read and carefully follow directions and warning labels. Most injuries result from improper use. Keep spectators at least 20 feet away and not downwind from where the fireworks will be set off. Light fireworks only on a smooth, flat surface away from all flammable materials, including dry leaves. Never try to relight fireworks that don’t function. Keep a bucket of water nearby in case of fire.